to create unique one-of-a-kind bracelets, earrings and necklaces. Together Glass & Sterling Silver create elegant jewelry you can experience for casual everyday wear, career and romantic evenings to even the most formal occasions and weddings. 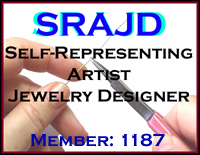 Custom orders are available and a selection of glass bead jewelry is available for purchase on the website. Unique Wedding Beads are custom made special orders taking 2-3 weeks to completion. From detailed floral designs to exquisite abstract beads in which the colors of glass react together in the heat to form various incredible color combinations, it is easy to fall in love with glass jewelry. In addition to the charming sea creatures & others that seem to create themselves as the glass is worked in the heat, they seem to win everyone's heart. In addition, solo pendant beads are created and displayed on sterling silver necklaces or available on leather cords. All beads are made with Italian Moretti Effetre, Vetrofond, Lauscha , Double Helix, CIM or Gaffer glass in the glass studio. You can be certain that every bead is kiln annealed for durability and strength, then cleaned and checked for quality, guaranteed for as long as you own it. EACH BEAD IS A WORK OF ART. ~ SCROLL DOWN TO SEE THE BEADS & JEWELRY FOR SALE! All of the Beads are made of glass and created by melting rods of glass with a torch in the glass studio. Each one is a work of art, handmade, original and unique. The Beads are annealed in a kiln many hours at high temperatures for lasting strength and believe me they are strong. Feel free to send an email with any questions you may have. Shipping to USA is included in the prices listed. For International shipping, please send email with your information to obtain International shipping charge information. PLEASE INQUIRE ABOUT CUSTOM MADE BEADS FOR YOU! Surrealistic Shapes & Colors Float on the Surface of the Tab-shaped Beads. As the Ever-changing Gray Colors Blend from Gray to Blues, You will Find Yourself Fascinated by the Abstract Shapes & Colors. Artist Joan Miro Certainly Would Have Loved This Bracelet Created in his Honor! & Clear Iridescent Swarovski Crystals with Heart Toggle Clasp. Metallic Silver Black Glass Adorns the Edges of the Large Granite Designed Focal Bead. The Small Black Beads appear to be Patina Silver but those too, are Metallic Silver Black Glass. The Beauty of this Bracelet lies in the Seven Yummy Butter Beads. The Color is more of a Medium Butter Yellow and Guaranteed to Invite You to Touch their Smooth Surface. The Granite Design in the Larger Bead is Stunning with the Ends of the Barrel Shape Having Two Smaller Metallic Silver Black Bead Shapes. This Longer Barrel Shape helps to keep the Bracelet in One Position on Your Wrist. Truly a Lovely Work of Art! On Jewelers Professional Stretch Cord. The Large Glass Tiger Bead is Textured with Twists of Soft Ivory & Silver within the Bead and then Encased with Clear Glass. Colors of Light & Dark Amber are Softly Traveling to Create an Abstract Tiger Design. Iridescent Swarovski Crystals cause Light to Dance between the Beads. on Professional Jewelers Stretch Cord. on Jeweler's Professional Stretch Cord. Pure White Italian Effetre Glass Blended and Twisted with Intense Black gives Motion and Depth to each Tiger Bead. Intense Black Accent Beads in various Designer Shapes Compliment the Bracelet Creating a Unique White Tiger Experience. This Bracelet's Translucent Bright Colors Blend into Rainbows as Your Eyes Travel Across The Beads. Subtle Depth Can Be Seen in Each Bead As You Get Lost in the Color Transitions. Simply Beautiful! There will be others, soon! Alabaster Ice Color Infuses these Earrings with a Slippery Texture that is Warmed by the Dark Turquoise Swirls & Details. A Delightful Pair of Unique Earrings. This Pink Tiger Necklace Seduces with its Powerful Tiger Design, Yet Gentle Shades of Pink Throughout Create a Peaceful Feeling. Alabaster Pink Beads Compliment the Main Focal Bead. Twisted Earth Colors Mixed with Clear Trail Along the Beads in Unique Pathways Giving Depth in 3-D. Delightful Shades of Pink Adorn & Compliment the Pink Swarovski Crystals. 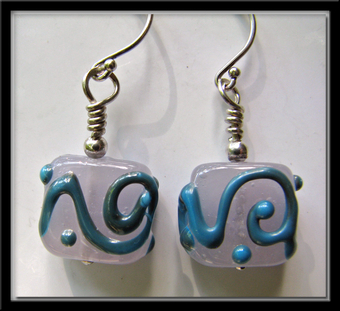 Earrings Length 1 - 3/4" Width 1/2"
Get Me To Ireland, So We Can Stray on Ireland's Green Shore. Where the Ocean is Endless and the Green Fields Go Forever, You Can Carry These Colors & Their Irish Charm and Hope to Visit There One Day. Shades of Green with Sky Blue Details, Earth Colors and Ocean Swirling Complimented by Black Swarovski Crystals. Surround Yourself in a Wash of Blues with this Floral Garden Bracelet. The 3D Flowers Call Out to be Touched as the Realistic Vines Lead You into Dreams of Flower Gardens. Full of Shades of Blue & Creamy Whites, This Bracelet is Certain to Delight! Handmade Glass Bayleen Beads reflecting the many blended colors of the ocean with strands of light shining through the layers of glass in rhythms like a Whale's Bayleen. Each bead is unique to make this exquisite original necklace. Necklace Measures 21 Inches in Length . This Bracelet's Sculptural, Delicate Pink Flowers decorate the Focal Bead with shades of Pinks & Greens. Textured Silver Bali Beads add Swirling Designs that are complimented by the Green & Blue Swirled Beads. This Bracelet's Sculptural Pointed Flowers in Shades of Pink Come Alive on the Focal Bead with Pink Tiger Stripes Underneath! Soft Pink Round Beads Compliment the Bracelet Creating a Bold Pink Tiger Experience. This Bracelets Twisted Colors of Blues, White & Earth Colors Float & Twist Gracefully Along a Soft, Creamy Pink for a Bit of Delight & a Hint of Curiosity. Bold Shades of Purple & Light Lavender Blend Well with the Bold Meandering Scrolling Lines that Adorn Three Main Beads Just Like Art Designs found in Many Tribes from Long Ago. Silver Bali Bead Caps & Leaves Honor Nature in a Beautiful Form. This Beautiful Combination of Enchanting Translucent Colors Among a Mellow Yellow Create Mystical Color Combinations to Soothe the Soul. Detailed Swirls on Silver Bali Beads Add Sophistication and Depth. Find Yourself Lost in the Tumbling of Earth Colors Mixed with Lavenders and Blues as they Seem to Float Above a Turquoise Sky in the Soft Round Tablet Beads. Each Bead is Uniquely Grounded with a Hint of Intense Black Details. A personal thanks to all who have made this possible, supported me along my journey now on its third decade and to those who had the vision and desire to enrich their lives with the artwork I have created over the years. will enrich the lives of others.